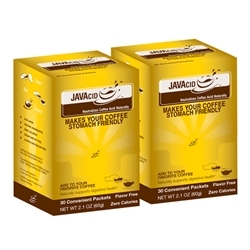 Have two boxes (60 packets) of JAVAcid shipped to your doorstep automatically each month, or pick your own delivery schedule. AFter I tried this for a month, even though it's still necessary for me to take prescription Xantac for acid reflux, at least I can enjoy 1 to 2 cups of coffee without a trigger. Then my husband gave it a try and he no longer has episodes. Quite happy with this product. I have IC & coffee was one of my worst triggers until I found javacid.. I love it!! !